Ever had an Uber driver that didn’t know where they were going? It’s a pretty frustrating experience, and there are plenty of Uber customers voicing their opinions about the problem on social media. So Uber has created a mobile game for iOS to help drivers figure out how to maneuver through city streets, starting with San Francisco. 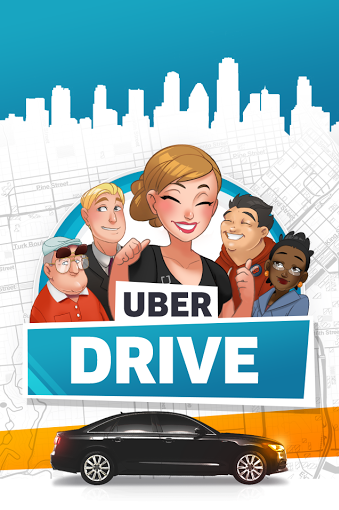 Called UberDRIVE, the game is meant to give players a sense of a typical day as an Uber driver. It works like this – You open up the game and see a bunch of characters you will work with throughout your day. Players pick up and drop off various passengers and identify markers around SF by tapping on an interactive map. 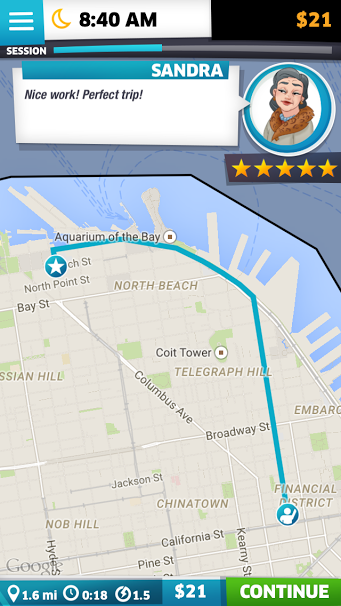 #uber when you're driver cancels me because can't find pier 27 in sf. Players earn points throughout the game as they accept trip requests in dispatch zones and take more efficient routes. The more points a player earns, the more chances they have to unlock better cars and new areas of the city. A character named Miss Emily encourages players as they move up in the game. (side note: I was told Miss Emily is based on a real character named Emily Weslosky who currently works as a driver operations manager at Uber). 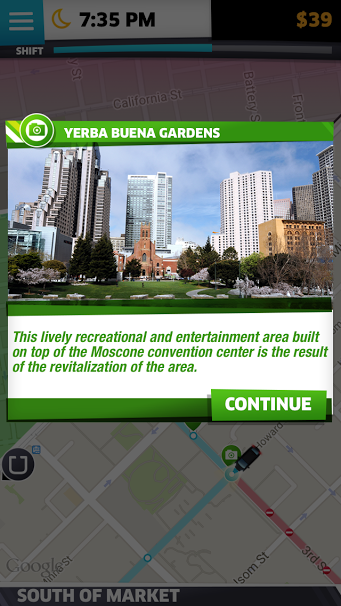 Uber has also embedded some fun facts about certain city landmarks and included a trivia mode so players can test their knowledge of a few SF destinations. The game started as a side project about a year ago. Senior product manager Mike Truong, who had worked in gaming before with Loud Crow and Electronic Arts building games like Need for Speed and Good Night Moon, came up with the idea for a game as a way to help struggling drivers who were new to the city. Anecdotally, it seems like there are a lot of new drivers lately. At least in my experience I’ve noticed most of my drivers still fiddling with the navigation system or telling me they are new. While we don’t have current numbers from Uber, the company did release data on a blog post back in January that said about 12 percent – or 40,000 – of Uber’s drivers were new. Uber doesn’t make this game mandatory for drivers to play, but perhaps it will help new drivers get the know the city a bit better and provide a better experience for riders. But there’s another use for UberDRIVE – it can also be used as a recruiting tool for potential drivers. As players move up in the game a prompt comes up asking them if they would like to sign up to become a driver. The screening process begins directly in the game if the player pushes the button. “UberDRIVE was designed as a fun and engaging resource for our driver partners to hone their navigation skills if they choose to. It’s also a great way for prospective drivers to experience firsthand what it’s like to drive with Uber,” an Uber blog post about the new mobile game reads. Uber is known for trying a lot of different ways to market the product, but campaigns have mainly centered around delivery (food, kittens). Though Uber spokespeople said Uber is not getting into the gaming business, this is a very different experiment for the ride hailing service. Will drivers play? Will it bring in new, young, fresh-faced recruits? Who knows. I have to add in here an odd experience I had on my way to Uber HQ to check out this new game that very much has to do with this story. My Uber driver Roger was a San Francisco native with four years of Uber driving experience navigating the over-abundance of one-way streets with no left turns of San Francisco. He knew the best, safest and most efficient route to take me, despite what Uber’s map told him to do. It was delightful. So delightful and so perfectly coincidental to this story that it made me wonder if Uber planted the guy. Uber spokespeople laughed and insisted he was not a plant. Maybe it just happened. But it was strange. Whatever the reason, I hope this game will provide more drivers like that. UberDRIVE is available for anyone in the U.S. to download for free in the App Store starting today.